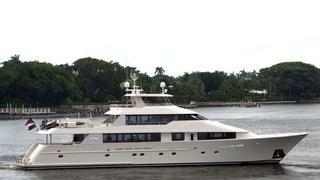 News now from Camper and Nicholsons that Ralph Raulin has signed the 39.6m motor yacht Trading Places IV for sale. A Westport 130 built in 2008 to a design by naval architect William Garden and formerly named Miss Sydney, she has a warm interior featuring raised panelled joinery in mahogany. Accommodation is for up to 11 guests in five staterooms - a master suite, two double staterooms and two twin cabins along with seven crew members. New Samsung HDTV systems feature throughout, and she has a drop down television on the boat deck. The large main saloon offers relaxation areas and panoramic views and leads on to a formal dining room with seating for 10 guests. Al fresco dining is available on the aft deck with ample seating and a full wet bar. Twin 2,735hp MTU engines give Trading Places IV a cruising speed of 24 knots and she is fitted with Naiad at anchor stabilisers for comfort in port. The asking price of Trading Places IV is available on application.